This week has been a mixture of work, school and planning my vacation to Europe. I’ve tried to stay on top of my blog posts so I can produce at least one post a week to keep you guys in the loop of what’s been happening and what I’ve been up to. First up, I WAS ON TV!!!! 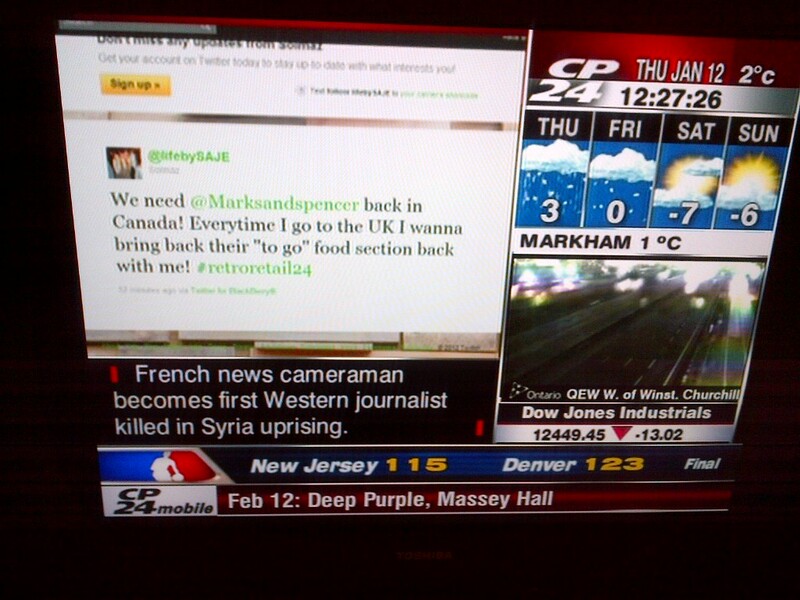 Well, my tweet was on TV, part of a group discussing about the stores/brands that have left Canada and the brands that should come to Canada. I love Marks & Spencer and I had to give’em a shout out and ask them to come back! What else…..planning a Euro-trip is not as easy as it sounds….I’ve been going through loads of tourism websites, airlines and blogs to figure out what I want to checkout while I’m on my vacation and how I’m going to get there (British Airways, I’m looking at you baby!). One thing for sure is that I want to stand in the middle of Grand Place in Brussels and take loads of pictures of beautiful architecture while eating AMAZING fries! Next PostMy Crumpled City Map Video Is A Hit!